Portion of a larger Paul Conrad cartoon from the 1970s showing President Richard Nixon caught up in a Watergate spider web. Paul Conrad, an American political cartoonist who distinguished himself in the 1970s by being named to President Richard Nixon’s infamous “enemies list,” did his best with his art to get under Nixon’s skin. In the 1970s, Conrad was among cartoonists who chronicled Nixon’s troubles during his presidential demise via the Watergate scandal. Watergate was the office complex in Washington, DC where the attempted electronic bugging of Democratic Party headquarters by a Nixon White House-led team of burglars, would lead to a White House slush fund, an attempted cover up, and ultimately Nixon’s resignation from office. Conrad’s spider web cartoon at right, for example, reveals a Nixonian web of Watergate co-conspirators, their names cleverly spelled out in the web’s structure — “Ehrlichman”, “Haldeman”, “Magruder”, “Dean”, and others. These were the men involved with Nixon in the Watergate scandal who, by their actions and participation, helped incriminate and ensnare President Nixon in the end. Paul Conrad was also probably the first cartoonist to associate the Watergate break-in with Nixon, publishing the cartoon below on June 18, 1972, the day after the Watergate break-in was reported as a minor burglary. At the time, only a handful of people even suspected there might be a White House connection. Conrad by then was an established national political cartoonist and known as an “equal opportunity offender,” lampooning all manner of politicians and public figures regardless of affiliation. Political cartoons, of course, have been an important part of the cultural landscape and print media for centuries. They have often proven to be especially illuminating of current events, educating the public, and becoming historic guideposts to what happened and when it happened. Paul Conrad’s work did its share of illuminating and educating, and as such his work was part of that time’s cultural tableau. Some of Conrad’s work is briefly reviewed here, mostly with examples from the Nixon years. Conrad’s cartoons, however, covered a range of politicians and he also used his pen to bring attention to social injustice, environmental pollution, civil rights, homelessness, corruption, war, and other subjects. In his career, Conrad skewered 11 presidents – Truman, Eisenhower, Kennedy, Johnson, Nixon, Ford, Carter, Reagan, Clinton and the two Bushes. He also won three Pulitzer Prizes for this work of poking fun at politicians during a 50-year career. He spent 30 years at the Los Angeles Times, where his lampooning helped raise the newspaper’s national profile. Paul Conrad working on a drawing at his desk, 1970s. Paul Conrad was born in 1924, in Cedar Rapids, Iowa, and grew up in Des Moines. He has often said his first drawings appeared on the bathroom stalls of his Catholic elementary school. After high school he and his twin brother went to Alaska, where Paul drove a truck and played piano in a brothel. During World War II, he served in the U.S. Army and fought at Guam and Okinawa, Japan. After the war he enrolled at Iowa State University to play in a dance band, but later dropped out, then enrolling at the University of Iowa. There, he began drawing cartoons for the student newspaper. After graduating in 1950 with an art degree, he moved to Denver and soon became recognized as one of the country’s leading young political cartoonists working at the Denver Post, where he stayed for 14 years. Conrad won his first Pulitzer there in 1964. He joined the Los Angeles Times that year after being contacted by it publisher, Otis Chandler, who was then trying to make his paper less conservative. The liberal Conrad gladly obliged. He spent the next 30 years there ruffling feathers of politicians and others. Frank Sinatra once called him “a disgrace to responsible journalism,” and in 1968, Los Angeles mayor Sam Yorty sued him for libel over a cartoon that suggested the mayor he had lost his mind. That suit was dismissed. Paul Conrad drew cartoons at the Los Angles Times six days a week, wining two of his Pulitzers there — one in 1971 and another in 1984. He retired from the Los Angeles Times (but not drawing) in 1993. In the 1970s, especially, Conrad’s favorite target was President Richard Nixon. Paul Conrad’s caricature of President Richard Nixon sitting amid pages and pages of his infamous “enemies list.” Caption reads: “His own worst enemy.” Date: 1973. The existence of such a list first became public when former White House lawyer and Nixon ally, John Dean, mentioned them during the Senate Watergate hearings. In his testimony, Dean then noted that a list existed containing names of those the president did not like. Later, a much longer list consisting of some 576 names was also revealed – a list which included hundreds of names that had been sent by Nixon’s people to the IRS in 1972 for possible tax audits. That’s the list on which Paul Conrad’s name appeared. Conrad, however, was in good company, as the full list included many political notables, selected publications, and celebrities, among them: Bill Cosby, Gregory Peck, Ted Kennedy, Shirley Chisholm, Joe Namath, Jane Fonda, Bella Abzug, Barbra Streisand, Carol Channing, The New York Times, The Washington Post, and many others. A Paul Conrad 1970s cartoon depicting President Nixon as a criminal barricaded in the White House with caption, “If you want me, you’re gonna have to come in and get me!” – reminiscent of some Hollywood movie scenes. For Paul Conrad, however, being on Nixon’s enemies list was no idle threat. The IRS audited Conrad’s tax returns for tax years 1968 to 1973. Conrad, in fact, had been in Nixon’s sights for some time. In any case, Conrad continued his Nixon drawings, some of which during the Watergate era became so strong that the Los Angeles Times moved them off the editorial page and onto the op-ed page. As Nixon faced an almost certain impeachment in House of Representative and likely conviction in the Senate, Conrad did an Easter Sunday cartoon of Richard Nixon nailing himself to a large cross that the Los Angeles Times refused to run, believing it too offensive. After the White House tape recording system came into play, helping incriminate Nixon, Conrad drew Nixon in a cartoon pinned down by audiotapes, after a scene from Jonathan Swift’s Gulliver’s Travels, with Gulliver (Nixon) among the Lilliputians. Near Nixon’s end in the White House, Conrad had Nixon in very dark cartoon with crown on his head quoting Shakespeare’s King Richard II: “O that I were as great as my grief, or lesser than my name. Or that I could forget what I have been. Or not remember what I must be now.” Later, at Nixon’s resignation and his famous departure by helicopter, Conrad drew Nixon’s helicopter flying over the White House with the caption: “One flew over the cuckoo’s nest.” Some years later, in 1977-78, Conrad savored some irony when he was chosen that year to hold the Richard M. Nixon lecture chair at Whittier College, the president’s alma mater. Paul Conrad, “We're Gonna' Make History, Hubert! !,” Los Angeles Times, 1968, Re: Continued Bombing of Vietnam. Syracuse University Library’s Special Collections Research Center. Conrad, mostly a liberal Democrat, was not partial to political party. In fact, in the 1950s, he voted for Republican Dwight Eisenhower, but later soured on Ike’s policies. Conrad’s cartoons weren’t all critical, and could also be praiseworthy, as one he did in 1958 lauding Eisenhower’s enforcement of the Supreme Court’s school desegregation order. Ike had sent army troops to enforce the law and help integrate Little Rock Central High School in Arkansas. Conrad also went after the Democrats. In the 1960s, he lampooned Democratic President Lyndon B. Johnson and became quite critical of Johnson. Conrad believed Johnson’s policies during the Vietnam War were despicable, drawing one 1964 cartoon showing Congress supplying the president with a “blank check” to wage war on Vietnam. Paul Conrad’s Nancy & Ronald Reagan in send up of “American Gothic” during 1980s farm crisis. Conrad also did some notable cartoons on Ronald Reagan. In fact, he first took after Reagan in the 1960s when Reagan was governor of California. Conrad’s cartoons often had Reagan in over his head, and he sometimes cast him as a clown. Los Angeles Times publisher Otis Chandler reportedly received a number of early-morning calls from Reagan or Nancy complaining of Conrad’s portrayals. But after Reagan became President, Conrad continued his lampooning. He once had the president shown as “Reagan Hood,” stealing from the poor to give to the rich. Another, shown at left, had Ronald and Nancy Reagan in a send up of Grant Wood’s classic American Gothic pose, made during the 1980s farm crisis when thousands of farm families were losing their farms to foreclosures, and as some charged, to Reagan policies. Conrad also skewered Reagan’s foreign policies; one cartoon had the president in a bathtub playing with warships and a rubber duck. In 1993, Conrad accepted a buyout from the Los Angeles Times, but he continued to draw syndicated cartoons for more than 15 years. In 1994, Paul Conrad cast Bill Clinton as playing the Republican's song. In his career, Paul Conrad also did some sculpture, and he designed limited-edition bronze figures depicting Ronald Reagan, Richard Nixon, John F. Kennedy, Robert F. Kennedy, Golda Meir and Martin Luther King Jr. One of his sculptures, entitled “Chain Reaction,” made of chains depicting the dangers of a nuclear war, was placed in front of the Santa Monica Civic Center in California. His cartoons have also been published in a number of books, including: When in the Course of Human Events (1973, with Malcolm Boyd), The King and Us (1974), Pro and Conrad (1979), Drawn and Quartered (1985), Conartist (1993), Drawing the Line (1999), and I, Con (2006). Paul Conrad's Sarah Palin, post-election 2008, slaying the Republican elephant. Paul Conrad turned out more than 20,000 political cartoons in his career, many of which were syndicated by the Los Angeles Times Syndicate and seen by millions. In 1993, he was the subject of a PBS documentary, Paul Conrad: Drawing Fire. After the 2008 election, he depicted Sarah Palin with a smoking machine gun in one hand as she held up the trunk of a slain Republican Party elephant in the other. Paul Conrad died of natural causes in September 2010. He was 86 years old. He leaves behind an important time capsule of 50 years of political and social observation. 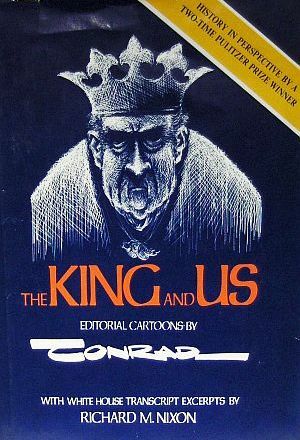 Paul Conrad’s 1975 book, “The King and Us,” with Nixon on the cover as Shakespeare’s King Richard II, from a 1973 Conrad cartoon. Click for book. Another Paul Conrad “American Gothic” send up, this one charging Ronald Reagan’s policies with driving small farmers out of business & killing their communities. Matt Schudel, “Paul Conrad, 86: Pulitzer-Winning Political Cartoonist,” Washington Post, September 6, 2010, p. B-4. James Rainey, “Cartoonist Had A Sharp Pen: His Drawings Bedeviled Nixon, Reagan and Others in Power. He Worked at the Los Angeles Times for Nearly 30 Years” (front-page obituary, at his death), Los Angeles Times, September 5, 2010. Tom Longden, “Paul Conrad’s Cartoons Carry Strong Messages,” Des Moines Register, March 25, 2009. “Master List of Nixon’s Political Opponents,” Wikipedia.org. William Claiborne, “IRS Ignored Bid to Audit ‘Enemies’ List,” Washington Post, December 21, 1973, p.1. “The Complete, Annotated Nixon’s Enemies List,” EnemiesList.info. Yvonne French, “Afflicting the Comfortable: Cartoonist Paul Conrad Puts Words Behind the Pictures,” Library of Congress. Paul Conrad, Drawing the Line: The Collected Works of America’s Premier Political Cartoonist, Los Angles: Los Angeles Times, 1999 (this collection of 200 Conrad pieces spans his career from the 1960s to the 1990s). Paul Conrad, Conartist: Paul Conrad: 30 Years With the Los Angeles Times, Los Angeles: Los Angeles Times, 1993 (a three-decade retrospective of Conrad’s work at the Los Angeles Times). Paul Conrad: Drawing Fire, Independent Lens/PBS Documentary, PBS.org, Independent Television Service (ITVS), October 2006. “I Con, The Brilliant Work of Paul Conrad,” Exhibition Photographs, College of the Canyons, Santa Clarita, CA, September 1 – September 30, 2010.